Dusenbery Shear Knives - Browse Our Stock Of Slitting Shear Knives | Carolina Knife Co.
Dusenbery bottom shear knives are commonly used for converting paper, film, foil, and non-woven products. 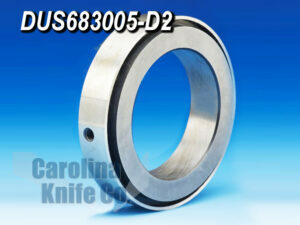 We manufacture these blades in D2, M2, CPM10V, Carbide, and 52100. Blade material selection depends on the material to be cut, cutting application, and budget. Rotary shear cutting uses two cutting surfaces typically referred to as TOP and BOTTOM blades. These rotary slitter knives spin in opposite directions allowing a sheet of material to pass smoothly through the blades, similar to a pair of scissors. Carolina Knife supplies a wide range of rotary cutting blade designs in all popular materials.